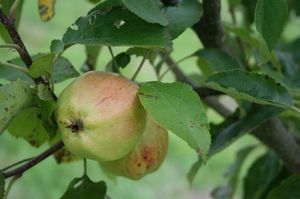 Cornish Aromatic - Dessert Apple Tree £12.75 - Dessert Apples - Late Season Apple Trees and Fruit Trees For Sale. Buy at competitive prices with wholesale discounts. As the name suggests this is a sweet but spicy Cornish apple that also has a sharp quality to it's flavour. The fruit have a russetted skin and the tree is vigorous and hardy. Found in Cornwall in 1813 this is a traditional English apple.